An event we wish to hold with three categories of audience: Girls,boys/men and Policy Makers on the need to support Menstrual Hygiene Management in order to make schools fun for girls. Wamina has been invited by Deaf TV to do a workshop on menstrual hygiene for 91 hearing impaired girls Wednesday, Thursday and Friday. 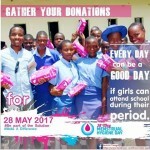 Women, men and government officials will be treated to a special evening program to create awareness on menstrual hygiene, as well as mobilize invitees to donate sanitary pads for adolescent girls and female street children.